CBTA is a new training and assessment option for people getting their motorcycle licence. Instead of taking a practical test at each stage of your licence, you can choose to have your riding skills assessed by an approved CBTA assessor. Although training isn't compulsory, we recommend you complete training before attempting the assessment ride. This will ensure that you have the necessary riding skills and you're fully prepared to do the assessment. The assessments are designed to ensure you're competent in a prescribed range of riding skills, which are important to keep you safe when riding on our roads. We are a NZTA Approved motorcycle CBTA course provider. What is competency-based training and assessment? CBTA is a new training and assessment option for people getting their motorcycle licence. Instead of taking a practical test at each stage of your licence, you can choose to have your riding skills assessed by an approved CBTA assessor. Although training isn't compulsory, we recommend you complete training before attempting the assessment ride. This will ensure that you have the necessary riding skills and you're fully prepared to do the assessment. The assessments are designed to ensure you're competent in a prescribed range of riding skills, which are important to keep you safe when riding on our roads. What are the benefits of CBTA? 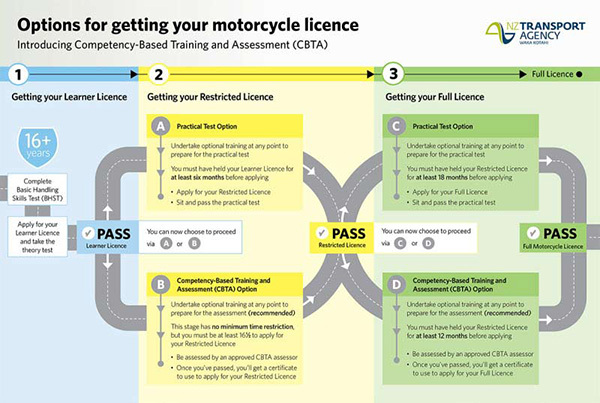 If you choose the CBTA option, there are a number of benefits: It can reduce the time it takes you to gain your restricted and/or full motorcycle licence - completing the CBTA course is the only way you can reduce the required minimum time during the learner and restricted licence stages It improves your riding skill levels by targeting high-risk riding behaviours, which allows for a safer road system for you and other road users If you choose to do your training through an approved CBTA assessor, you'll get feedback on your riding skills and you'll get tips on how to ride smarter and safer. These improvements will help prepare you for the CBTA assessment, and help you make smarter choices on the road. You can start training for either stage at any time after getting your learner or restricted licence, so you're fully prepared to undertake the assessment. Once you're satisfied that you're competent in the skills required for the assessment, you can book and undertake the assessment ride. Note there is a seperate charge for the assessment. Riderskills™ have a course specifically designed to determine your current level of competence and will tailor the training to suit your learning requirements. the course is conducted one on one - just you and the instructor to enable you to gain maximum benefit from the expert coaching session. Assessment - CBTA uses the knowledge and experience of industry based assessors who have been approved by the Transport Agency to train and assess motorcyclists riding skills. Our Chief Instructor Philip McDaid has been involved in the development of the CBTA programme and is approved to test instructors who wish to deliver the CBTA programme. All of our instructors hold an advanced roadcraft qualification so you can be assured of the highest quality coaching in preparation for your CBTA Assessment. Just want to book an assessment without taking training? This option is provided for riders who have a good understanding of roadcraft and wish to progress to the restricted licence stage. We strongly recommend attending the CBTA training course to prepare for the assessment if you have not already done so. This option is provided for riders who have a good understanding of roadcraft and wish to progress to the full licence stage. We strongly recommend attending the CBTA training course to prepare for the assessment if you have not already done so.